It’s hot and sticky. My keyboard feels kind of yucky and I don’t really feel like typing but it’s Saturday and we already paid for this hexagon so we’re going to push it out. This doesn’t mean mean that you’re going to get a substandard Hexup, or even that I’m loathing having to write it, but it’s hot and sticky and I’m ornery okay? Besides, any day I can use the word ornery is a good day. Anyway, today’s Hexup contains some interesting tech news, a map of the human brain, some cools toys, and even some linguistic musings. I hope you all enjoy it. 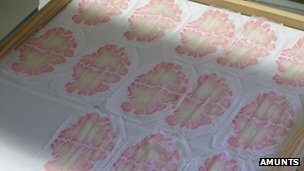 Researchers from around the world have assembled the first ever digital 3D map of the human brain map made from high definition scans of an actual brain. A donor brain was sliced into some 7400 sections and each was then scanned in a process that took ten years. Called “Big Brain” the model has been made freely accessible to neuroscientists around the world through the journal Science for for use in their research. The map is so detailed it allows even individual neurons to be seen. Read all about it over at the BBC website. Researchers at UC Davis are developing a remote control helicopter that they hope they will be able to use to help look after crops in California. The helicopters are about the size of motorcycles and similar ones are already seeing heavy use in Japan. Crop dusting is a dangerous job that pilots are killed preforming every year. The researchers hope that these copters, equipped with both crop dusting equipment and cameras, will help. This article reminds me of the story we looked at last week for uses of re-purposed military drones. The Mars rover Curiosity has been slated to become immortalized in LEGO. LEGO announced that a fan designed model of the erstwhile rover would be the latest released as part of their COOSUU (“imagination” or “wish”) program. The program allows LEGO users to propose and design models that they want to see made available in LEGO. 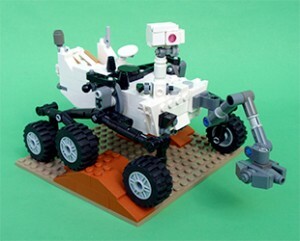 The LEGO Curiosity was designed by Stephen Pakbaz who worked for NASA and helped build the original rover. See the full story over at Yahoo news. The question is: If you wanted to find out how a dragonfly’s brain works while it’s busy out being a dragonfly what would you do? The researchers over at the Howard Hughes Medical Institute think that they have the answer: a tiny back back. The scientists have equipped some dragonflies with tiny back packs that weigh no more than a few grains of sand. The packs contain computers that are wired directly into the insect’s body and brain as well as a transmitter to broadcast the data back to the lab. The story is covered over at Wired.com. As I was wandering around the internet today looking for the penultimate side to our glorious hexagon of awesome I came across this little gadget. It’s use seems fairly limited but the potential is very cool. Basically it’s a little guy you stick to your window that has a solar panel facing out and a socket on the back. You can accrue sunlight throughout the day to charge small devices at night. I think there is a lot of potential here for personal devices that help utilize renewable energy sources. What Is The Shortest Poem? If you haven’t checked out Vsauce over there at the YouTubes this is my way of telling you that you should. He does a lot of videos about the way way things work, the way things are perceived, and how ordinary things are amazing. He also likes to ask some really bizarre questions that I’m sure some of us have wondered about at one time or another. This is his latest video in which he asks the question “What is the Shortest Poem?” and quickly gets sidetracked into what peotry is and how we communicate meaning with next to no information. Anyway, that’s all from me. Have a great weekend!